I’m going to miss some regular posts as my sister, her husband, and I are leaving for Indiana in a little bit for a family medical emergency. We have a sister up there whose health has turned for the worst. While we’ve talked on the phone and emailed, we’ve never actually met(from our father’s first marriage) and this will be our last chance. She’s had problems with throat cancer and a couple of strokes. We’d always planned to meet some day and one sister, from our end of the family, has already left us. So things are kind of rushed right now. We’d intended to leave in the morning, but a call spurred us to quicker action. I’m waiting for them to arrive now. See you next week some time. I first gave an overview of the Dumarest Of Terra series HERE. 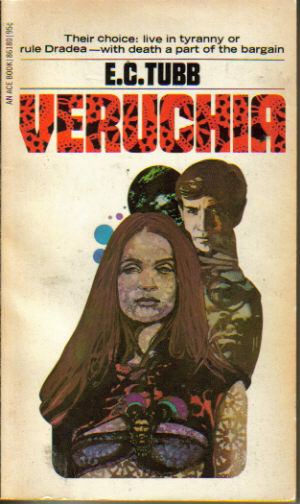 VERUCHIA is the next title in line in my reading of the entire series in order. If possible. One of the later titles is rather high on the used book sites. We’ll see when I get to that point. A long way ahead. Earl Dumarest continues his quest for his home planet, Earth. He’d left there when ten years old, stowing away on an outbound spaceship. The old Captain, feeling sorry for him, had adopted him and taught him how to survive. Earl became a traveler, one who goes from planet to planet, usually working to build a stake for passage to the next world, exploring what he finds. Biologically, Earl is not an old man, but chronologically, due to the vagaries of the cheaper low passage, suspended animation, and high passage, drugs that turn hours into months of real time, he’s much older. A clue has led Dumarest to the planet Selend to find the city of Korotya, where connections that might lead to Earth were to be found. he was only fifty-eight years to late. The hidden city had been revealed then by a nuclear explosion deep in the jungles. It would be another hundred years before anyone could get there to explore, not that there was likely to be anything not melted down. Disappointed, he was leaving when he was suddenly attacked, a dart hitting him in the back of the head. Before he went out, Earl managed to whirl and pluck out the eye of his assailant. The screams brought help. When he regained his senses, it was in a hospital, Earl found himself penniless. His accounts, accessed by the chip in his arm, had been drained by hospitalization, research to find the poison in his system, and the cost of high passage. You see, the planet of Selend took a dim view of such things and he was being deported the next morning. Never one to allow himself to be manipulated, Dumarest slips from the hospital, heads to the space port, and buys low passage on a freighter leaving immediately. That’s how he ended up on Dradea and doing the only thing he could to earn passage to the next world: combat. Well versed in the fighting arts, he found himself facing a crell, an eight foot tall bird bred for size, speed, and ferocity, armed with razor sharp claws and beak. The last five combatants had all died. After dispatching the bird, he’s hired by a man to protect a woman named Veruchia, a wealthy noble related to the Owner. She’d won a huge sum of money betting with her cousin Montarq, owner and breeder of the crells. He suddenly finds himself involved in political intrigue when the Owner dies and the question of inheritance comes between Veruchia and Montarq. Both claim it as their birthright. When the First Ship had landed, the owner had claimed the planet as his own and it had passed down through inheritance of the oldest child in the family. The dead Owner had two younger siblings, the fathers of Veruchia and Montarq. As he had no children of his own line, it would fall to one of them. Montarq claimed it as he was the older, but Veruchia believed she was descended from the real first Owner, Chron, on her mother’s side. Chron was a legend that most people tooka as just that: a legend. At the claimant hearings, it was decided to Veruchia had one hundred days to prove her claim, otherwise Montarq inherits. She decides they need to find the First Ship, which was lost in the mists of time, if it still existed. Earl decides to help her and Montarq decides to kill them. And the Cyclans, those human computers, are around as usual. They want Dumarest because he has a secre stolen from them they would give them ultimate power. He knew not that he had it for a long while. But he did now and was determned they wouldn’t have it. 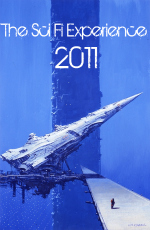 I like these books, science fiction adventure at it’s finest, and look forward to the rest. Clarence Scott Boyles, Jr.(1909-1995) wrote under the pseudonym of Will C. Brown. He was born in Baird, Texas of cattle raising families on both sides. A newspaper journalist, he published several stories in the pulps before WWII and began his writing in earnest after his discharge from the Marine Corps after the war. THE BORDER JUMPERS in 1955 was his first novel and it was received well, winning the Dell Book Award for best western of 1955. His novel THE NAMELESS BREED won the Golden Spur Award from the Western Writers of America as best novel in 1961. Lincoln Jones was on his way to Fort Worth to hire a teacher for the people of the Odessa region of west Texas. The area had tamed down and families were settling there. Lincon and his wife Lucy had a couple themselves. He took the stage to the small town of Crosscut, there to catch the train for the trip to Fort Worth. That’s where his troubles began. Chatted up while waiting by a gambler named Beasley, he attracted the notice of the town Marshall who thought his face looked familiar, though he couldn’t quite place it. Link just wanted to get on the train and get out of there. he knew why he looked familiar to the lawman. His next turn of trouble came while the train was on a wood stop. Link and Beasley were toting the wood, along with other male passengers, when the outlaw band attacked. Link was exasperated because his gun belt was in his valise with the money belt of $600.00 at Lucy’s insistence. Civilized men did not wear guns in town. Beasley had a small pistol which Link appropriated to help the express car guard. However the man, nervous, was shooting at anything that moved. The gang was driven off and the train takes off before they can regroup. Link and Beasley, along with a saloon singer named Billie Ellis, who’d went for a walk while the wood was being loaded, were left behind. Alone, afoot, a cold night approaching, with two town people in tow, Link knows shelter needs to be found soon. And he knows of only one place to go. An old line shack he remembered from his youth as a place the old Dock Tobin gang had hid out briefly after an operation. Dock Tobin was his uncle, a man who owned a ranch in Mexico, a man who often led his gang across the border, when money was short, for his criminal forays. Orphaned while a young teenager, Link had been sent to live with his uncle. He hated it and the criminal stuff his family engaged in. his mother had fled that at an early age and married. Link was the horse minder, never engaging in the robberies and murders. He fled that as well when he got the chance and headed west for a life away from his vicious family. His third bit of bad luck came next. he’d hoped someone had taken residence in the old shack and that they might be given food and shelter. Someone had. The Dock Tobin gang on another of their expeditions for money. they had been the ones who’d hit the train. Old Dock was half blind now and all crazy. His very nasty cousins Claude and Coaley were there as well. the rest of the gang was all new. Link had two civilians to mind after, find who had his money belt(he’d found his valise as well as others from the train in the barn), clear his name, and get them safely away from the crazy old man. THE BORDER JUMPERS was made into a film I covered here that starred Gary Cooper as Lincoln Jones. 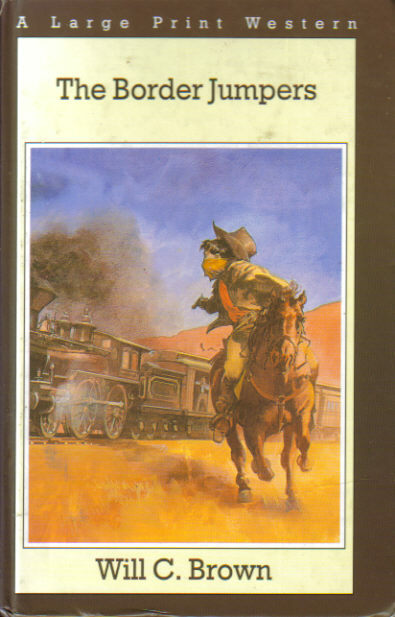 Cooper’s character was twice the age of the one in the book. Understandable. The plot of the film followed the novel pretty much straight up until the final third, a few scenes were shifted around, otherwise, even down to the dialogue it was close. That last third, the showdown, was considerably different, though surprisingly close. That might not make sense, but is true. My copy of the book is a large print hardcover edition from Great Britain published in 1996 by Chivers Press/G. K. Hall & Co.
RAWLINS CROSS is not so much forgotten as re-establishing. The Canadian band was formed in the late eighties with brothers Dave and Geoff Panting and Ian McKinnon. Theirs is a blend of rock music with bagpipes, accordion, and mandolin. It falls into the Celtic rock genre. I first became aware of them when Sandra Ruttan posted a clip of one of their songs which quickly became a favorite. When I investigated, I was disappointed to learn they’d disbanded in 2001 and retired. Band member Ian McKinnon was kind enough to drop me a comment on my own post that the band had reunited and was recording again. The result was ANTHOLOGY, a greatest hits set with three new songs. They’ve also just released a CD of all new material, HEART-HEAD-HANDS, which I haven’t ye picked up. But ANTHOLOGY has been ripped to my music file so I can listen while I work. And the videos accompanying the music contain extraordinary imagery, slices of life, just odd bits, that all seem to fit the music. The second clip is early in the band’s exstence. these guys were young. I could go on for a while. Great band, great songs. If you don’t have this band in your collection, consider getting ANTHOLOGY anyway. it will be a nice introduction to the band. MAN OF THE WEST was one of the last handful of films Gary Cooper appeared in before his death in 1961. It was 1958 when the film was released and was directed by Anthony Mann. Cooper is Link Jones, an ex-outlaw that has gone straight, leaving the gang his uncle ran without notice some years before and began to forge a life outside outlaw circles. Married, with children, his neighbors knowing of his former life, forgiving him, he was now headed, with the town’s savings, to hire a teacher. At a train station in a small town, his troubles begin when the town Marshall knows his face is familiar, but can’t quite place it. On the train ride away, the engineer stops it when a number of logs block the track. Link takes charge of removing them when suddenly an outlaw gang rides from under a nearby bridge and attacks. Caught afoot in a gun battle, Link and a few others, guards for the money shipment, drive them away, the train jumping off before they return. Unfortunately Link, a gambler, Sam Beasley(Arthur O’Connell), and a woman, Saloon singer Billie Ellis(Julie London) are left behind. Afoot, in the middle of nowhere, without food or water, Link knows of only one place to go. An old farm house where the gang used to work from in the old days. Unknown to Link, they still used the place. Getting there, he’s confronted by his uncle, Dock Tobin(Lee J. Cobb) and his cousins, the vicious Coaley(Jack Lord), Claude(John Dehner), and the mute Trout(Royal Dano). They have his money now and he’s determined to get it back. The folks trusted him with their savings and he intends to use it the way intended. Dock Tobin wants him back in the gang, Coaley just wants to kill him. Claude doesn’t trust him and also wants him dead before he can betray Tobin. Trout just does what they want. Link has to protect Billie and Beasley. Claude has also brought word that that Marshall finally remembered Link’s face and figures he was on the train as part of the robbery attempt. A heavy load for an aging man that hadn’t rode the outlaw trail in years, his carefully built up world crumbling around him. A fine little film and one I’m going to use as a double-up. Friday for Forgotten books I’m featuring the novel it was based upon, THE BORDER JUMPERS by Will C. Brown. 1. Psychosomatic(ebook) – Anthony Neil Smith: the crime author’s first novel available for the first time as an ebook. 2. Choke On Your Lies(ebook) – Anthony Neil Smith: the crime author’s latest novel available as an ebook. 3. Tom Swift and The Electronic Hydrolung(ebook) – Victor Appleton: I couldn’t resist picking this one up. Another I don’t think I read as a child. 4: The Snake Den(ebook) – Chuck Tyrell; first western our friend Gary Dobbs purchased for Solstice’s new western ebook line. 5: Wild West Anthology(ebook) – a collection of 23 western novels from the first decade of the twentieth century. Heavy on Brand and Grey, William MacLeod Raine is also here. I couldn’t resist the $.99 price. 6: The Complete Western Stories of Elmore Leonard(ebook) – thirty tales from the author’s early days. 7: The Affair of The Wooden Boy(ebook) – Ian Doyle: Mel Odom is the author. This is one recommended from several reliable sources. 8: Fatal Beauty – Burl Barer: A true crime story. Not a big reader of this genre, though I read one now and again. I do like Burl Barer’s work though. The only real “book” this week. Never would have thought it in the past, but I’m getting used to this ebook thing. It will never replace my books, but it has it’s place. I had a good day on my picks Last Saturday. Four for four. I only hope the percentages today will be as good. The three o’clock game today has the Green Bay Packers coming into Chicago, renewing their ancient rivalry with the Bears. The longest standing such in the NFL. The two teams have played 181 times in their long history, but, surprisingly, this will be only the second time the two have meet in the playoffs. The first was for the NFL Championship in 1941 where, if memory serves, the year before the Bears waxed the Redskins 73-0 for the championship. No, I’m not quite that old all you wags. I’ve just heard about it. I think the Packers will take this one. Their offense is better and the defense is pretty close to that of the Bears. Tough game, but the Packers prevail. The late game will be the big one for me. The New York Jets at the Pittsburgh Steelers. The Jets have been on a roll of late, taking down first Peyton Manning and his Colts, then the impossible, according to many, beating the Patriots in New England. Remember they lost up there just a few weeks before 45-3. A lot of trash talking went on back and forth between the two during the week before. It apparently worked for the Jets as they took the vaunted Patriots down, sacking Brady five times. Keeping my fingers crossed, I’ll go with the Jets once more. It’s worked twice despite the opinions of all the “professionals” and I’m hoping one more time. Another milestone by the way. As I’ve said before, I started this thing on a whim, no idea that day I logged on that I was going to do any such thing. For good or bad, I’ve had more to say and blog about than I ever imagined. I’ve did books, movies, personal stuff, and politics. And anything else that crossed my mind when I sat before the keyboard. I’ve made some friends, a fact I’ve had to explain to people. This blogging thing, in my mind, works sort of along the lines of the old pen pal letters. With the advent of the computer age and emails, less of that goes on. I can’t remember the last time I got anything personal through snail mail but Christmas cards. I hope I continue to have things to say. As long as I can anyway. None of us are getting any younger. 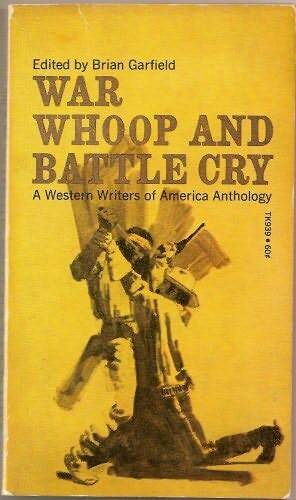 WAR WHOOP AND BATTLE CRY, edited by Brian Garfield, was a 1968 publication of Scholastic Book Services. That would put it in the young readers class I suppose. I remember when I was a boy buying many a book from Scholastic through school. The four stories here are three reprints and one original for the book, two short stories, a novelette and a novella. The link between the stories is that of Indians and cavalry confrontations. RED BLIZZARD and UPRISING were published in Esquire in 1951, TRUMPETS WEST! in Argosy in 1945, and “NO-FIGHTS” is the new story for the anthology. 1. TRUMPETS WEST! by Luke Short: Cavalry Lieutenant Burke Hanna is the only man who seems to care about his men and the Apaches he was sent to herd back to the reservation. He left with five weeks rations and, when he caught up with Ponce and his bunch, they were starving. He sent dispatch with requests for more rations, but was denied. He got everyone back, but all were half starved, down to one horse(several had been slaughtered for food) and sore footed. The post commander was unsympathetic because Hanna had been complaining about the crooked Indian agent shorting the Apache with thin, bony cattle, but charging premium prices. Unfortunately the commander was engaged to the agent’s daughter. When he refuses to go back out when the Indians break out again, he’s facing court-martial. The collusion between commander and agent will be hard to prove. On top of that he’s supposed to marry in the next few days. 2. “NO-FIGHTS” – T. V. Olsen: The war-like braves of the Sioux didn’t like the young Indian. He was thoughtful and quiet and had a twisted lame foot. They called him No-Fights. His father-in-law had taken his family out of the village just ahead of banishment and they were alone. The father-in-law and his two sons had gone hunting. He was left with the women. When No-Fights saw the four soldiers riding toward them, one obviously wounded, he knew it was trouble. Though in uniform, they were slovenly looking and seemed to be looking for trouble. One kept eying his wife. Being the only man in camp, it was up to No-Fights to do something. With no weapons and four to one odds, what? 3. UPRISING – Clifton Adams; The Colonel had his orders. Guard the Indians and only fight if attacked. He was a strict interpreter of his orders. But now, in a skirmish, several men were dead and the coach full of passengers, four men and a woman, they were accompanying all killed. Still he had to obey orders. Didn’t he? 4. RED BLIZZARD – Clay Fisher: Two blizzards were baring down on Fort Will Farney that week before Christmas, 1866. Scout Pawnee Perez, a half-breed, brought word. The thick. gray clouds were building in the sky. Perez’s word was of the red blizzard coming. He’d spotted Tashunka Witko and five hundred braves forging through the snows. The fort commander and his officious Major weren’t even alarmed when he told them the translation of the chief’s name. Crazy Horse. When the second scout came in with a report of two thousand Indians, they still didn’t think it was a big deal. They could handle a “few” Indians. Suddenly they are surrounded by Indians, the white blizzard hits, firewood is short, and no one wants to volunteer the 190 mile ride to a telegraph post to send for help from a fort further down the line. The temperature is well below zero. Perez is in the stockade for “deserting” rather than ride into an obvious trap he tried to warn the officious Major about repeatedly, rebuffed every time. A fine collection from the Western Writers of America. Back for the third post in a row on the 87th Precinct. 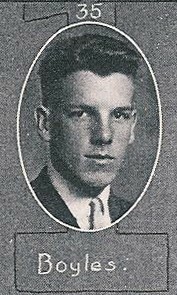 I discovered an episode of the television series that starred Robert Lansing as Steve Carelli and Ron Harper as rookie detective Bert Kling. Norman Fell appeared in four episodes as Detective Meyer Meyer and Gregory Walcott as Detective Roger Havilland in four as well. The story is of a young mother found shot to death at her place of employment. As the detectives of the 87th interview family, friends, acquaintances, and the lover, differing pictures of the victim emerge. Loving mother, ambitious wife, pool hustler, a woman wanting success. But no clear idea of who the murderer was. R. G. Armstrong has a significant role as the boss/married lover and Nancy Kulp, Miss Jane from The Beverly Hillbillies has a small part in the prologue as the woman who discovers the murder victim. I enjoyed the look into the old series and recommend it for anyone interested.